This quintessential dish of Taiwan is created by the savory flavors of quality meat, fresh vegetables, soft noodles, and Knorr® Liquid Concentrated Beef Base. Put beef in a pot, cover with cold water; bring to a boil. Skim any impurities. Add wine, peppercorns, garlic, tomatoes, star anise, onions, Knorr® Professional Liquid Concentrated Beef Flavor Base, chiles, and ginger, bring to a boil. Reduce heat to medium; simmer for 1 hour. Remove from heat; let sit covered for 1 hour. Remove beef and reserve for soup garnish. Skim fat; strain and reserve broth; discard solids. Add vinegar and season with soy sauces and sugar. Bring a pot of salted water to a boil, add noodles and cook until softened, drain. 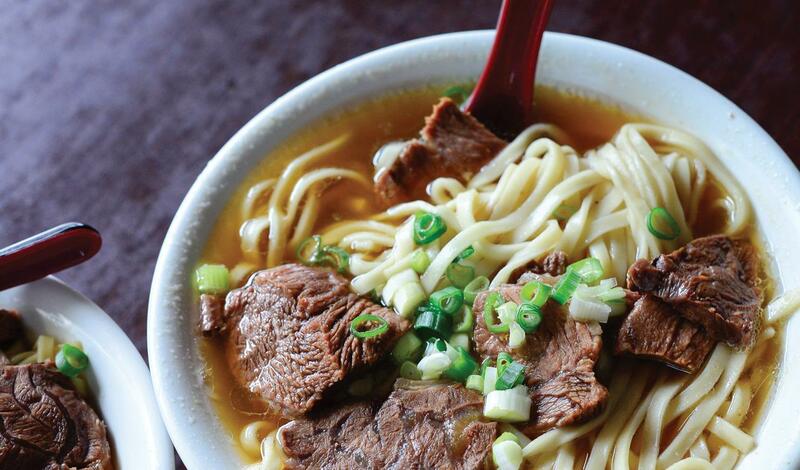 Divide broth, beef, bok choy and noodles among bowls. Garnish with greens.